The surprise election of Donald Trump electrified financial markets and pushed the Dow above 20,000 for the first time. The prospect of the Republican Party controlling all three branches of the US government, combined with Donald Trump’s fiery pledges to cut corporate tax rates and embark on large-scale infrastructure spending programmes, has driven equity markets, the US dollar and US interest rates significantly higher. Financial markets around the world now anticipate substantial fiscal easing and a programme of deregulation under the new administration. 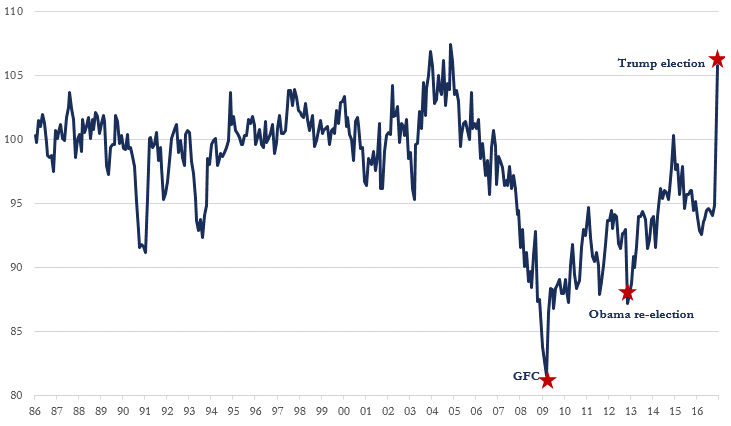 The chart below (next page) shows the US National Federation of Independent Business (NFIB) Small Business Optimism Index, for which data has been collected for since 1973. In December 2016, the month following Trump’s election, the index rose to 105.8, the highest reading since December 2004. On a month-on-month basis, two of the 10 underlying components in this index accounted for 73% of total index gains: the outlook for business conditions and expectations for real sales growth. Small business accounts for 49% of private-sector employment in the US and 46% of private sector output. It is a section of the economy that feels it has largely missed out on the current economic expansion. Aggressive monetary easing from the US Fed has pushed asset prices to record highs and interest rates to effectively zero (in real terms) for large borrowers. However, such actions have a limited impact on small businesses which hold few assets and which, eight years after the financial crisis, still struggle to secure financing. The bullish arguments underpinning the current market rally are thus based on the idea that the small business sector ight now begin to participate in the economic recovery in earnest. Such participation could create a virtuous self-reinforcing cycle, with increasing aggregate demand putting to work latent economic capacity and lifting employment and wages, the effect of which would be to further increase aggregate demand. The idea is thus that the small business sector might now provide a new leg to the current economic expansion (already the third longest post-war US expansion on record) and the equity bull market that has ridden alongside it. “Optimistic consumers and business owners are more likely to bet (spend and hire) on a future that seems to hold promise, but to maintain the enthusiasm, reality will play an important supporting role. The appearance of a new customer is much more powerful than the expectation of one”. Since the election of Trump until the time of writing (26 January 2017), the S&P 500 has risen by 7.9% while the Russell 2000, an index that measures the small-cap segment of the US equity market, has risen by 16.0%. In tandem, US government 10-year yields have risen by 0.66%, while the US dollar index reached a 14-year high during December, although it has since retraced some of those gains. These are not insignificant moves and it is worth reflecting on what markets have now priced in, ahead of any actual action being forthcoming. Whatever your views on Trump, he has put forward scant detail on what his economic policies will entail and which ones he will actually pursue (can you simultaneously build a wall, repeal Obamacare and cut corporate taxes?). It is fair to wonder therefore, how much of his agenda he will actually be able to implement. In 2008, Barack Obama arrived into office also promising a revolution in Washington. Like Trump, he too led a party that controlled all three branches of government. Eight years on, few people today would say that Obama’s legacy has matched his incoming rhetoric of reform. Unlike Obama, Trump arrives into office with the lowest approval ratings ever for an incoming president. Only Donald Trump (and hopefully Donald Trump) knows what a Trump presidency entails. 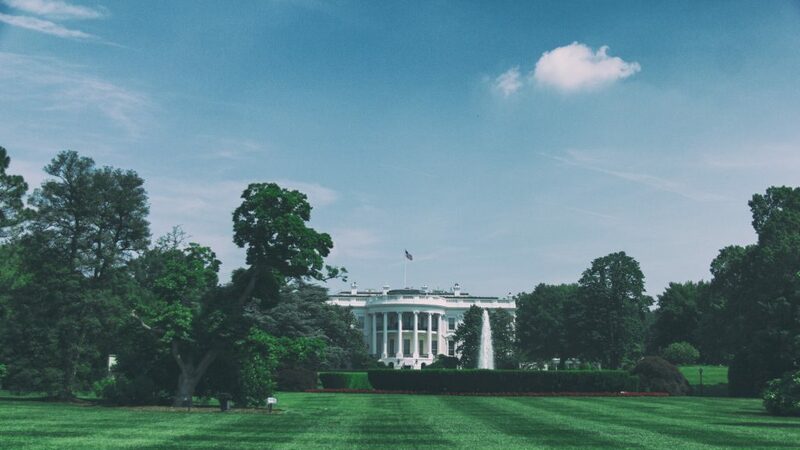 Since his election, the market has broadly had to consider three key new policy agendas for the incoming administration: i) growth-supportive fiscal easing, ii) increased market protectionism and iii) new geo-political concerns. To date the market has focused almost exclusively on the first of these. While fiscal easing certainly has the potential to stimulate growth, the established economic consensus is that protectionist policies shrink the aggregate economic pie. Meanwhile, it will be instructive to see how markets respond to, say, a military incident in the South China Sea. For the market rally to sustain itself and move higher, reality will need to catch up to hope. Donald Trump is certainly a new kind of politician, but his promises to deliver a new kind of politics are not. Markets are probably correct to be anticipating a programme of (unfunded) fiscal stimulus. However, how much of this is already in asset-market pricing, and what is the impact to US growth and market sentiment from the enactment of some of the protectionist policies Trump has championed? This article is the opinion of the writer and does not consider the circumstances of any individual. Staude Capital Limited is an appointed representative of Mirabella Advisers LLP, which is authorised and regulated by the Financial Conduct Authority.